LAS VEGAS (Nov. 10, 2015) – He’s no ordinary Joe any longer. 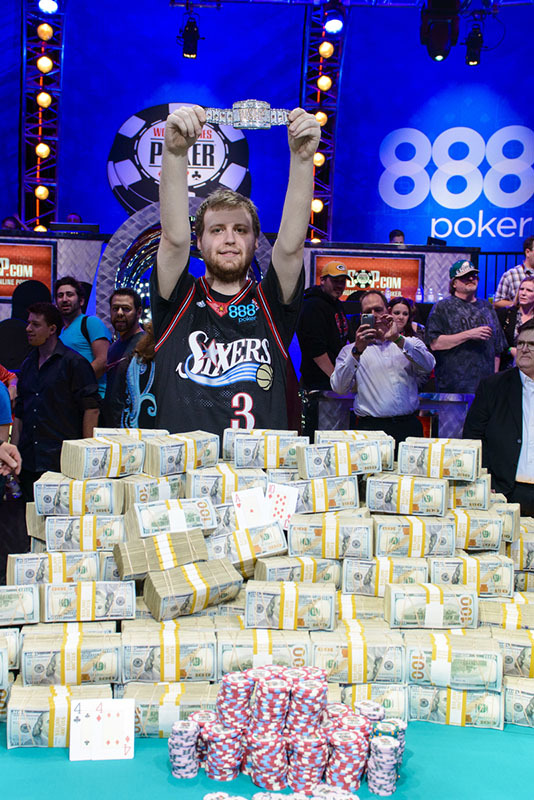 Philadelphia’s Joe McKeehen, 24, became poker’s world champion on Tuesday, leading wire to wire at the final table to capture his very first World Series of Poker (WSOP) gold bracelet and the top prize of $7,683,346 in gaming’s richest and most prestigious event. The chip leader entering the final table, the North Wales, Pennsylvania resident managed to extend his lead during each of the three days of final table play, until he was the only player left with chips. McKeehen used his chip advantage throughout, constantly putting pressure on his opponents and having a hand in their demise time and time again. He ended play in July by knocking out the noted professional Daniel Negreanu in 11th place, and then proceeded to knock out the 10th, 9th, 8th, 7th, 4th, 3rd and 2nd place finishers too, on his way to poker’s top crown. The runner up was 25-year-old Marlton, New Jersey resident Joshua Beckley. Beckley’s terrific run finally ended after besting 6,418 other hopefuls, but he leaves with $4,470,896 for his efforts. He entered the final table in seventh place with just 29 big blinds, but he picked his spots very well, always seeming to make the right move at the right time, and came within one spot of becoming the world champion. McKeehen’s Ace-Ten bested Beckley’s pocket fours, when a ten came on the flop, giving McKeehen a pair of tens, and Beckley couldn’t improve on the turn or river card. McKeehen, a well-respected pro, finished runner up in a WSOP event in 2014 for $820,863, and now has his signature breakthrough victory at the WSOP, joining the esteemed list of Main Event champions and WSOP gold bracelet winners. With the victory, McKeehen, despite his young age, has now won nearly $11 million playing poker for a living. From an event that began way back on July 5, 2015 with 6,420 hopefuls who each ponied up the $10,000 entry fee and received 30,000 in starting tournament chips, McKeehen, wearing a Philadelphia 76ers jersey on the final day, similar to past winners in 2012 and 2013, who also sported sports jerseys, ultimately outlasted them all, capturing all 192,600,000 chips in play and winning the $7.683 million first place prize and the Josten’s-crafted half-million dollar WSOP gold bracelet. The total prize pool up for grabs in the event was $60,355,857. McKeehen captured the WSOP world championships late this evening at the Rio All-Suite Hotel & Casino in Las Vegas in the famed Penn & Teller theatre. The event took nearly 40 levels of play to complete, which equates to nearly 80 hours of poker play to reach a victor. In real time though, the event took 10 playing days, spread out over 128 days to become the champion. When play began in July, players started with 30,000 in chips and the blinds were at 50 and 100. When play completed at 8:00 pm in Las Vegas with 24 minutes, 22 seconds left in Level 39, blinds were at 500,000 and 1,000,000 with antes of 150,000. Three-handed play began Tuesday evening at 6:00 pm PT and lasted exactly 90 minutes before Neil Blumenfield was eliminated. Blumenfield, 61, from San Francisco, California, was looking to become the event’s oldest winner since Johnny Moss (66) won the title 41 years ago. The recently-laid-off software executive from the Bay Area, almost didn’t enter this event after having second thoughts about paying the $10,000 entry fee just weeks after his layoff. But he made the decision to play, turning the $10,000 investment into a $3,398,298 payday. Blumenfield would have also become the first amateur to win the event since Jerry Yang took the crown in 2007. It took another 30 minutes before McKeehen defeated his final opponent to make history. Monday’s action was carried on a 30-minute delay on ESPN2. Tonight’s finale was carried on the flagship ESPN on 30-minute delay. The 2015 WSOP Main Event began in July with a total of 6,420 entrants. The event’s total prize pool was $60,355,857, with nearly $25 million going to the final nine players. A record total of 1,000 entrants cashed in the event. As has become tradition in recent years, Main Event play was suspended in July when the tournament reached its final nine players. It resumed with the “November Nine” taking to the felt 117 days later, on Sunday with 57 minutes and 36 seconds remaining in Level 35, with antes of 50,000 and blinds at 200,000 and 400,000. Play lasted nearly 5 hours and 45 minutes in real time on Sunday, but consumed 4 hours, 10 minutes of tournament clock play and led to the elimination of three players. Monday’s action started with 47 minutes and 26 seconds left in Level 37 with blinds at 300,000 and 600,000 with a 75,000 ante. Three more players were eliminated in Monday’s play that spanned 3 hours, 45 minutes and ended in Level 39, with 1 hour, 52 minutes and 31 seconds left in the level. The 2015 WSOP attracted a record 103,512 players from 111 countries to its 68 events, generating a total prize pool of more than $210 million. The World Series of Poker® is the largest, richest and most prestigious gaming event in the world, having awarded more than $2.2 billion in prize money and the prestigious gold bracelet, globally recognized as the sport’s top prize. Featuring a comprehensive slate of tournaments in every major poker variation, the WSOP is poker’s longest-running tournament in the world, dating back to 1970. In 2015, the event attracted 103,512 entrants from 111 different countries to the Rio All-Suite Hotel & Casino in Las Vegas, and awarded more than $210 million in prize money. In addition, the WSOP has formed groundbreaking alliances in broadcasting, digital media and corporate sponsorships, while successfully expanding the brand internationally with the advent of the World Series of Poker Circuit Tour in 2005, the World Series of Poker Europe in 2007 and the World Series of Poker Asia-Pacific in 2013. For more information on the World Series of Poker, please visit www.wsop.com.